I have been working for a while in a new feature for Almanah, tagging support. And is ready for user testing, so feedback is welcome. At the moment there is no great functionality, just tag the diary entries, but is the first step to allow the user make searches based in tags, print just entries with some tag, and so on. This new feature has required some design modifications to the main window, including a new header in the diary entry view, where the tags are placed. Take a look. The tag widgets have been written from scratch with Cairo and fixed colors, so remains a lot of work in accessibility and the use of theme colors. The little “x” in the right allow the user to remove the tag for this entry, but I think it’s small and dificult to press, so need some work. Of course, you can get the code and test it. 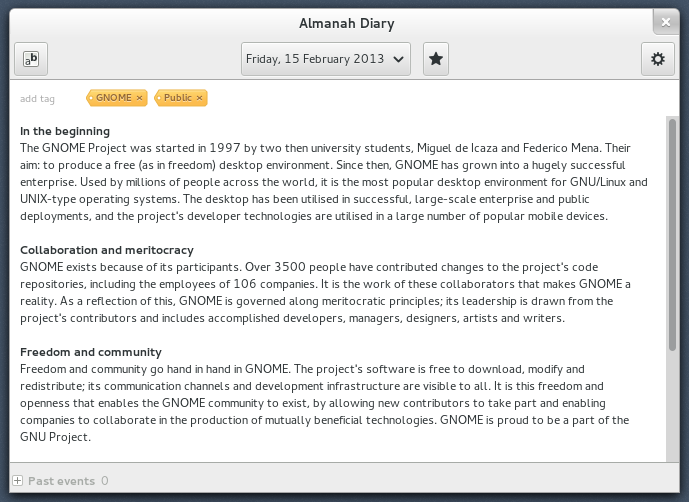 Get it from Git git://git.gnome.org/almanah.